On May 13, 1945, twenty-four officers and enlisted men and women stationed on what was then Dutch New Guinea boarded a transport plane named the Gremlin Special for a sightseeing trip over "Shangri-La." A beautiful and mysterious valley surrounded by steep, jagged mountain peaks deep within the island's uncharted jungle, this hidden retreat was named after the fabled paradise in the bestselling novel Lost Horizon. But unlike the peaceful Tibetan monks of James Hilton's book, this Shangri-La was the home of Stone Age warriors - spear-carrying tribesmen rumored to be headhunters and cannibals. But the pleasure tour became an unforgettable battle for survival when the plane crashed. Miraculously, three passengers survived - WAC Corporal Margaret Hastings, Lieutenant John McCollom, and Sergeant Kenneth Decker. Margaret, barefoot and burned, had no choice but to wear her dead best friend's shoes. McCollom, grieving the death of his twin brother also aboard the Gremlin Special, masked his grief with stoicism. Decker, too, was severely burned and suffered a bloody, gaping head wound. Emotionally devastated, badly injured, and vulnerable to disease, parasites, and poisonous snakes in the wet jungle climate, the trio faced certain death unless they left the wreckage. Caught between man-eating headhunters and the enemy Japanese, with nothing to sustain them but a handful of candy and their own fortitude, they endured a harrowing trek down the mountainside - an exhausting journey into the unknown that would lead them straight into a primitive tribe of superstitious natives who had never before seen a white man - or woman. Drawn from personal interviews, declassified Army documents, personal photos and mementos, a daily journal kept between the crash and the rescue effort, and original film footage, Lost in Shangri-La recounts this incredible true-life adventure for the first time. Mitchell Zuckoff reveals how the determined trio - dehydrated, sick, and in pain - traversed the dense jungle foliage to find help; how a brave band of Filipino-American paratroopers, led by a dogged captain, risked their own lives to save the survivors; how the Americans would be protected by and eventually befriend a noble native chief and his people; and how a cowboy colonel was willing to risk a previously untried rescue mission to get them out. The cabin crumpled forward toward the cockpit. The walls of the fuselage collapsed as though sucked inward. Both wings ripped away. The tail section snapped off like a balsa wood toy. Flames shot through the wreckage. Small explosions rang out like gunshots. Black smoke choked off the light. The air grew bitter with the stench of burning metal, burning leather, burning rubber, burning wires, burning oil, burning clothes, burning hair, burning flesh. One small mercy was that Nicholson had managed to point the nose of the plane skyward in his attempt to clear the ridge, so the C-47 hit the mountain at an upward angle instead of head-on. As a result, although fire rushed through the cabin, the Gremlin Special didn't explode on impact. Anyone not immediately killed or mortally wounded might stand a chance. The story of the rescue mission told in Lost in Shangri-La was not well-known in recent years. Did this surprise you? How much did you know about World War II as it affected this part of the world before reading this book? What did you learn about the war for the first time while reading? How does the author describe the natives' view of war as it compares to World War II? Were the Dani more of a threat to the survivors or were the survivors and their rescuers more of a threat to the tribespeople? Does either group really let down their guard? Lost in Shangri-La is a wonderfully readable account of the demise of the Gremlin Special, of inner-tribal warfare, and of World War II military history. Zuckoff doesn't cease to fascinate as he touches on topics such as the WAC, Filipino forces, tactical rescue, and indigenous peoples. Shangri-La doesn't bog down with overdone detail, but rather, offers the opportunity for insight and tender reflection long after you close the cover. (Reviewed by Megan Shaffer). This is an absorbing adventure right out of the Saturday-morning serials... Lost in Shangri-Ladeserves a spot on the shelf of Greatest Generation nonfiction. It puts the reader smack into the jungle. A riveting tale in the hands of a good storyteller... Lost in Shangri-La is the most thrilling book, fiction or nonfiction, that I have read since I can't remember when. This excellent book will be enjoyed by anyone who loves true adventure stories of disaster and rescue. Starred Review. Polished, fast-paced and immensely readable - ready for the big screen. Starred Review. In our contemporary world of eco-tourism and rain-forest destruction, Zuckoff's book gives a window on a more romantic, and naïve, era. His real-life tale, deftly brought to life in Mitchell Zuckoff's highly readable account, has more than enough Tinseltown trademarks to entice potential film producers… Lost in Shangri-La is an entertaining, enjoyable page-turner, ripe for the IMAX screen. A mesmerizing narrative. …Energetic and empathetic, Zuckoff delivers a page-turner for WWII readers. A lost world, man-eating tribesmen, lush and impenetrable jungles, stranded American fliers, a startling rescue mission. This is a true story made in heaven for a writer as talented as Mitchell Zuckoff. Whew - what an utterly compelling and deeply satisfying read! Lost in Shangri-la is a riveting work and a thrilling journey to the beginning of time. Along the way, Zuckoff discovers not only the truth about the crash and its aftermath, but also deeper truths about how modern and prehistoric people view the world, each other, and themselves. Amazing book, the ending was great. It seems that Tootsie Roll Industries would have little to do with Mitchell Zuckoff's book Lost in Shangri-La. 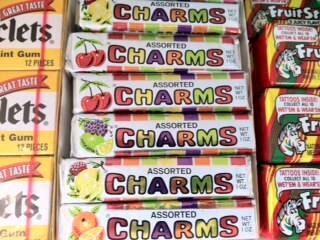 However, since acquiring the Charms Candy Company in 1988, this business has been the producer of Charms - the very food that provided the Gremlin Special's passengers with enough sustenance to survive in the jungle. "Breakfast was water and more Charms, still their only food on the third day after the crash," writes Zuckoff. "They separated the candies by color, eating the red ones until they tired of them, moving on to yellow, and so on."